Got out of bed (maybe that was my first mistake!) after a restless night of heartburn city. That's what you get for taking an Arthrotec pill before bed and washing it down with a sausage roll and ice tea. Well, it says to take with food! So I get up, take a rake through my hair and rip out half of it. Oh crap! No time for a shower this morning. Have to take Jessica to school. Thank God that's almost finished!!! After washing my hair down the drain (and probably clogging it) I head off to school. Of course that means taking the road that's still being worked on. (I think they started it back in...1862). Whew! I make it to school, drop off my daughter, who strangely enough is quite friendly and not in her usual PMS Barbie stage. On the way home, the gas vaporizes (I'm sure I had a quarter of a tank) and I head back home, thankful to be able to get some work done and enjoy my coffee. I call up a friend and talk to her about writing (is there anything else?) and go to top up my coffee...and lo and behold, it's cold. I mean, the entire pot is cold. Let me clarify. The light on my coffee pot is on, which should mean the plate warmer is on. But the warmer is cold. So I go to heat up my mug in the microwave. Oh...did I mention that my microwave is broken? The darned thing won't "clear". That means that you have to use up all the minutes before setting it to a new time. So I used up someone else's 8 seconds and went 30 seconds more. Two hours later I decide to make a fresh pot. That's when I see it! There is still 2 cups of unboiled water left in the coffeepot. Two cups of coffee that should have been made. Ok, now what's going on here? I turn off the pot, turn it back on and...nothing. So now I have a choice. I can continue to write the last few chapters of The River (which incidentally is getting really good...I wonder what'll happen next??) OR I can go buy a new coffee pot! Oh come on, people!!!! Is there really a choice! Of course I bought the new coffee pot! Not only has Shaw TV Red Deer contacted us regarding Josiah's dream to go to Drumheller, Alberta, they'll be interviewing him while he'd there. The Drumheller Mail will be interviewing Josiah and his mom, Lisa, during their stay as well. 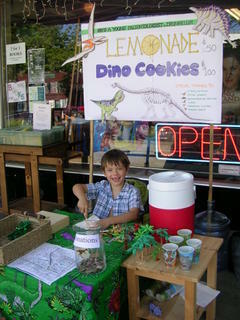 And the Drumheller Valley Times may have an article out about little Dino-Man this week. Watch for it! There'll be an online version as well. Well, the seed was planted. All I was hoping for was maybe someone in Victoria would pick up the story and run it...so that more people would stop by Lisa and Josiah's lemonade and dino-cookie stand. I never had any idea that it would take off like this! Please check the Project Drumheller for all the info, news and list of sponsors. You can also check my site for the odd update! Now for the most exciting news....the Ellen Degeneres Show requested a video of Josiah after seeing one of my press releases. Lisa and Josiah recorded a cute video with Josiah describing the different dinos and their habits. Who knows?? There could be a trip to the US in their future! AND...Josiah will be meeting his idol, Dr. Philip Currie--esteemed paleontologist and curator of the Royal Tyrrell Museum in Drumheller. The museum has wonderfully donated some exciting activities to Josiah and his family. Dr. Currie's name is familiar to young Josiah. He has the world-renowned dino-hunter's book and videos. Lisa and Josiah will be in Drumheller in mid-July. This will be the trip of a lifetime for little Dino-Man...and I'm so glad that I got to be a small part of this journey...that I got to plant the seed, watch it grow....and that for once...no weeds! Project Drumheller shows that dreams really do come true...if you want them badly enough and if you're open to gifts from the universe. Grand Opening of My New Site! Welcome to My New Site's Grand Opening! I've updated my website at www.cherylktardif.com in order to make it easier to navigate! Check out my mystery novels, reviews, excerpts and short suspense stories all from the comfort of my new home page. Order Whale Song, Divine Intervention or The River (once it's released) directly from my publisher and see where I'll be signing books next. Cheryl Kaye Tardif ~ Canadian Mystery Author...coming to a bookstore near YOU! I've been involved with a special project that's been nicknamed Project Drumheller. Project Drumheller is a publicity campaign that I started in order to help my friend Lisa take her son Josiah to Drumheller to hunt for dinosaurs! Josiah is a six-year-old budding paleontologist who has dreamed of traveling to Drumheller, Alberta, to see the "Dinosaur Capital of the World". And I am doing everything I can to help him get there. 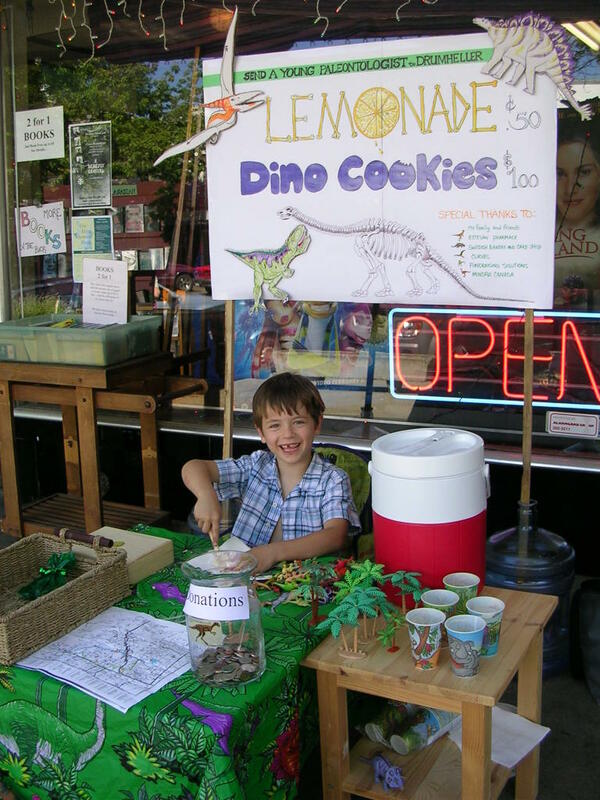 If you are in Victoria, you can check out Josiah's lemonade and dino-cookie stand at the Estevan Street Market every weekend in June. You can also pick up a copy of Whale Song or Divine Intervention at Josiah's stand and 50% of the sales will go to Project Drumheller! Already Josiah and his mom, Lisa, a hard-working single mom, have been interviewed by CBC Radio (Victoria) and a leading talk show has shown an interest in this project. Rumor has it a major fast food chain is considering SPONSORING their entire trip! One of the other sponsors is Mindful Canada www.mindfulcanada.com, which has been responsible for garnering gift certificates and other goodies for Josiah and Lisa. Let's see how much we can get edited. So today's goal...to edit and tighten 3-5 chapters. And that means I'd better get cracking! Set daily and WEEKLY goals! If you miss them, readjust the next one. If you reach them, pat yourself on the back. If you exceed them, take the night off! I will post more tips for writers on my Blog...so check back often. Welcome to Cheryl Kaye Tardif's Mystery Blog! This is my new, improved blog....and it'll probably prove to be as much a mystery to me as it will be to you. I am hoping to add new blog posts every Monday to fill you in on what I'm writing, what I'm doing other than writing, where I'll be signing books, my newest release, and anything else that escapes the 'mystery' that I call my brain. Please be sure to check out my new improved website at http://www.cherylktardif.com sometime after June 27th, as it is completely being overhauled. Someone mentioned to me awhile ago that for a mystery writer, my website looked a little too friendly. So, I figured it's best to correct that now, right before the launch of my newest thriller. The River is now set to be released sometime in September. The date had to be pushed back a bit because I am doing everything to make this my BEST novel to date! And I hope you'll agree! The River is an action-packed techno-thriller that takes place on the Nahanni River in Canada's Northwest Territories. Based on actual stories of headless corpses and bodies washed up on the Nahanni's shores (along with some mysterious disappearances), The River gives a gruesome, nail-biting explanation to an area some refer to as Canada's Bermuda Triangle. Also, please check out Whale Song, my debut novel which has captured the hearts of people of all ages in many countries. Whale Song is currently being considered by a film producer and a screenplay is in construction. 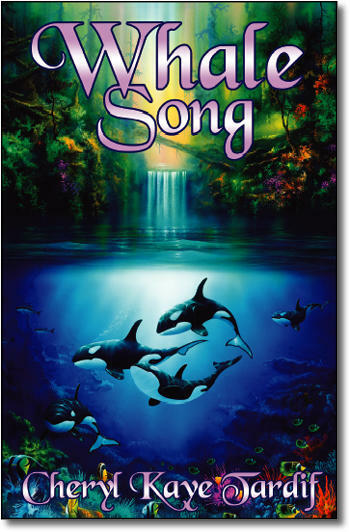 Whale Song is an emotional mystery about a young girl who loses her memory after a terrible tragedy changes her life forever. And you can check out the first in my Divine series that has been compared to J.D. Robb's 'In Death' series. J.D. Robb, as some of you will know, is Nora Roberts' pen name, so to be at all compared to her is a huge honor! Divine Intervention introduces a new kind of government agency, the PSI division. These psychic agents work secretly to solve serial cases across Canada and in other countries. Jasmine McLellan is one the key agents, a pyro-pschic who can read the remnants of a fire and see through the arsonist's eyes. 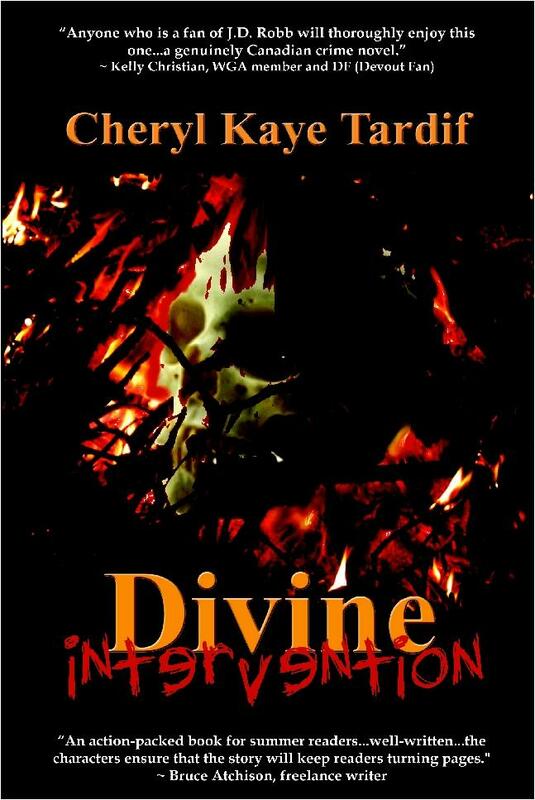 Check out Divine Intervention, a scorching psi-fi mystery with a burning twist! If you love a good mystery, I invite you to check out my novels and my website!